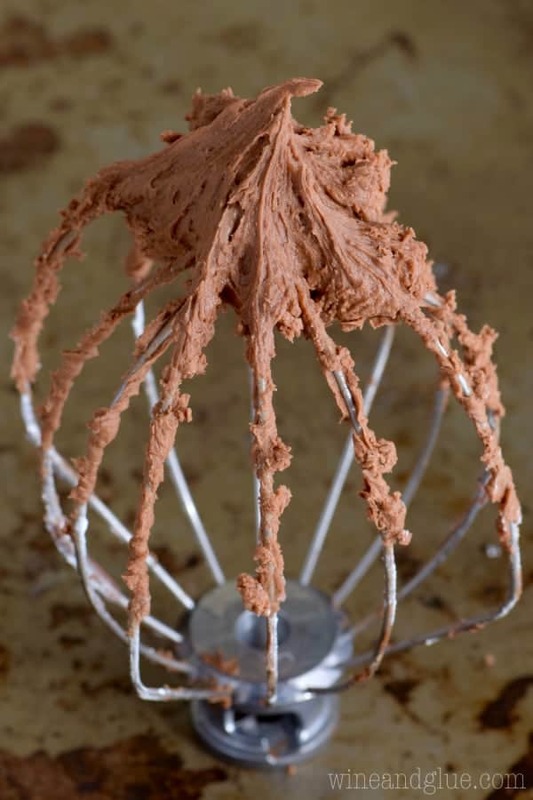 The BEST Chocolate Buttercream Frosting and it is so easy to throw together! So a few years ago . . . somewhat on a whim, I posted this Vanilla Buttercream Frosting. It came after my sister in law casually asked me if I had a vanilla frosting recipe I liked, and lo and behold I had just come up with one that I really liked. I shared it with her and she raved about it. Can I tell you something? Sometimes it *really* helps to have someone you respect tell you a recipe is good . . . my family is really picky and can’t always be trusted. Anyway! She loved it. I posted it. And it has been the MOST popular recipe on my blog since. Since I posted that recipe, I have had several people ask for a chocolate counterpart. Basically the same recipe in chocolate. Folks! I think we have it! This recipe is chocolate (obviously), it tastes **amazing** (if I do say so myself), and it behaves just like it’s vanilla counterpart. It pipes beautifully, and then it firms up. Frosting is my absolute weakness. I remember as a kid how my mom would let me put frosting between graham crackers for a treat. A little frosting sandwich. And I was HOOKED. Since I stared the blog I have made a few frostings, and every time I do I have to stop myself from eating it by the spoonful. Ooooor . . . sometimes I don’t stop myself. Anyway. A total weakness. 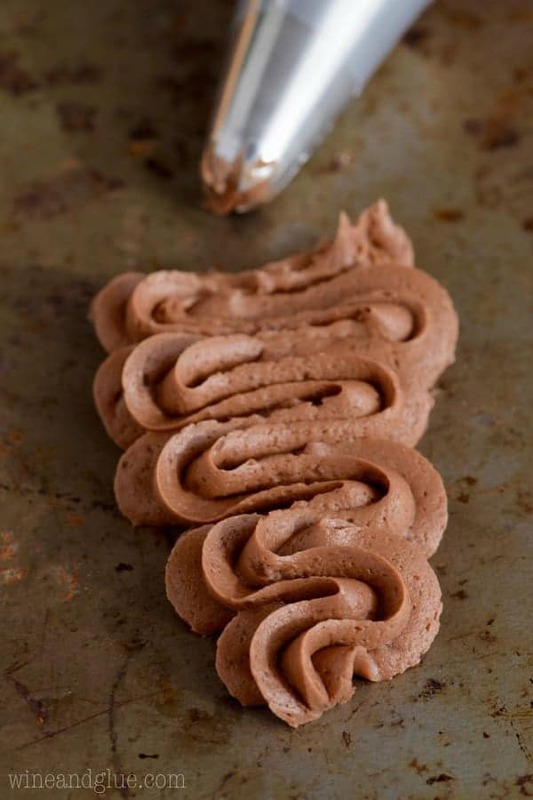 And this frosting doesn’t disappoint. I kept taking licks and spoonfuls . . . and worrying there wouldn’t be enough left for the photo shoot, lol! Yup. I like frosting that much. 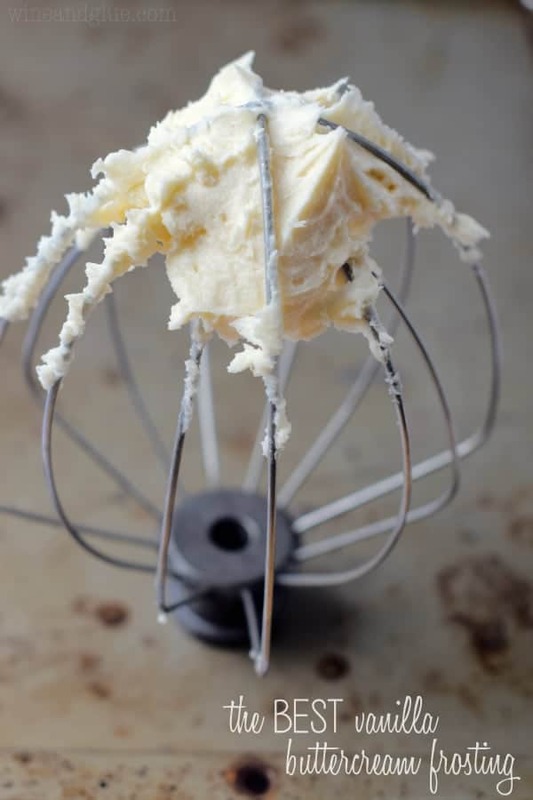 Beat the butter in a stand mixer or a large bowl with a hand held mixer. The butter **must** be room temperature for this recipe to work. Do not microwave it. You should be able to easily dent the butter with your finger but NOT push all the way through. If your butter is too stiff or too soft, the recipe will not turn out. I hope you like it Becky! I Know I will change the amount of Chocolate [ I like a darker frosting ] This sounds very easy. Thank you for sharing. I hope you like it Vicki! I haven’t measured out the recipe in cups, but I would say it would lightly frost 24 cupcakes, heavily frost 12 cupcakes and will need to be doubled for a layered cake. 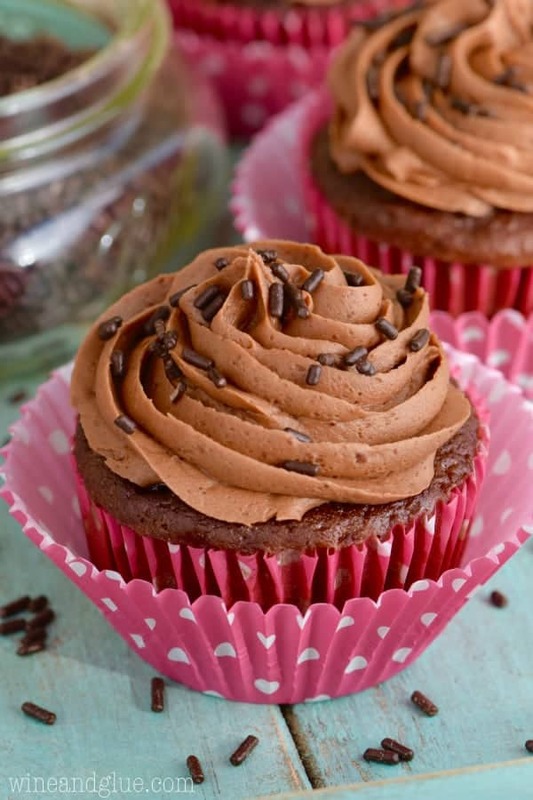 What brands of cocoa powder, chocolate chips, and powder sugar do you use? I always have a hard time figuring out what brands of chocolate I should buy. 🙂 Thank you! Hi Jill! I tend to use Hershey’s unsweetened cocoa powder, and Nestle’s chocolate chips. Do you use milk choc. chips or semi-sweet? I always use milk chocolate, but either would work with this recipe. First — this frosting is completely delicious! All of my family commented on it’s goodness and my adult daughter licked every last drop. It really is yummy!! Second — I had a severe consistency issue and maybe you can help. I whipped the butter (which wasn’t melted, but I could definitely push my finger all the way through), added the melted chips, vanilla and cocoa powder — but could only add 2 1/2 cups of powdered sugar before it was too thick to pipe. Then I added the heavy cream, but could only add another 1/2 cup sugar before it was again too thick to pipe. I even put it in a frosting bag and TRIED to pipe it. So to salvage it — I doubled everything (but the powdered sugar), but could only get in an additional 3/4 cup of sugar. My total sugar was maybe 4 1/2 cups, but I had to double everything else. It worked (yay!) and was still delicious (yay!) I piped it onto the cupcakes (yay!) and the world was saved (yay!) — but where did I go wrong in the beginning with the consistency issue? So, I guess the good news is, hooray it still worked! You really do have to have the butter just at room temperature, but I wouldn’t think that would make it too thick, I would think if anything runny butter would mean you need to add MORE powdered sugar than is called for. Is there any chance that you packed the powdered sugar? That can add a TON more powdered sugar without intending to. I just loosely poured mine into a measuring cup and tossed it in. 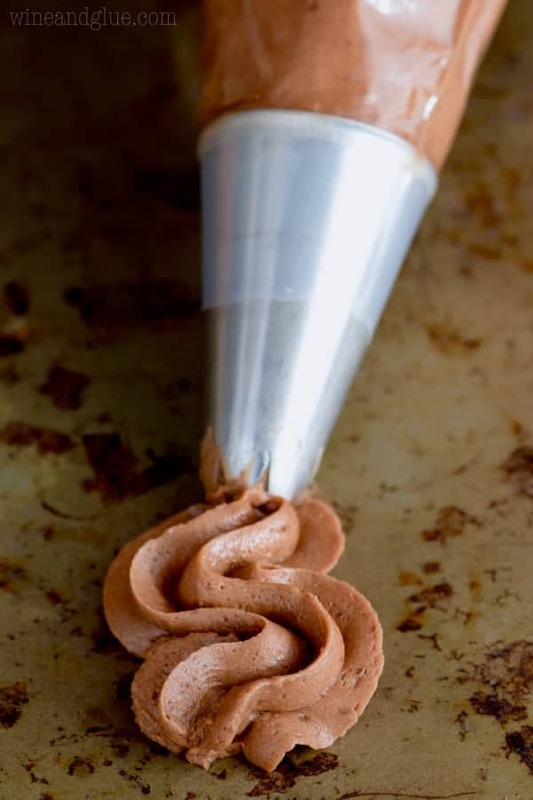 If you are using a spatula to frost the cupcake or cake…etc. try using two different metal spats. One in hot water and the other in cold water. The hot spatula will allow the frost to soften whereas the cold one will help it set. if you’re having issues with a piping bag try taking some of the frost out. Hen knead the frosting that remains in the bag. A warm towel can help soften it as well. Sometimes the biggest challenge isn’t just the ingredients but rather the surroundings of The person working with the pastry. Imagine frosting ten triple layered cakes with this frosting in a proofing station meant for baking breads. The air would be way too hot. On the other side of things imagine the same but trying to frost the items while in a very cold kitchen. The frosting would be too hard to work with and may cause your cake to start crumbling where you put the frosting. Another idea is to try not to allow the butter to over soften, leading to a almost melted texture. Especially as it requires to be whipped in a mixer. 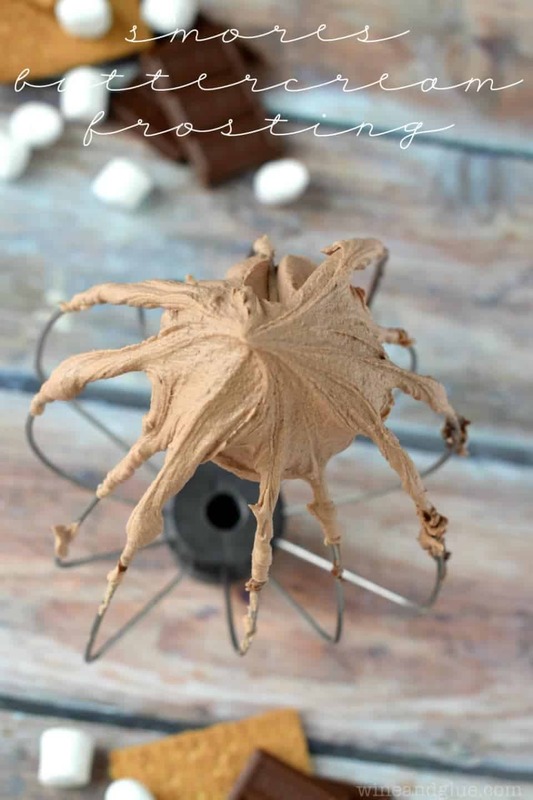 Over whipping that with the other ingredients can lead to a very grainy texture and continuing to mix it may even lead churning a very messy butter. I hope these tidbits help. Enjoy baking! I had the same problem! 2 cups of sugar in and the icing was as like a ball of play-doh! I added the cream then had a ligh butterscotch colored icing, very fluffy, decent taste but not very chocolate. I noticed once it was on the cake it looked like it was breaking down. I dipped the powdered sugar out of the bag. So, I may have had some packing, inadvertently. The color was so off too. I used semisweet chips and Hershey’s cocoa, brown vanilla too! How was your butter? I find that the biggest variable in frosting making is the butter. It can’t be rock hard, it can’t be melty. It needs to be perfectly room temperature. Should this be unsalted butter? Yes! Thank you for asking this Theresa! Hello!!! * How much time could stay out of fridge?One day? I would say one to two days. Can I use this frosting immediately on cooled cupcakes or should it be refrigerated for some time first? I would use it right after making it. Refrigerating it first will make it hard to pipe. Hi can you please tell me how much time do you take tge butter out for it to be right for this recipe. Louise, I don’t think I can give you at time frame because it totally depends on the temperature of your house. Generally, in my house if I cut up butter into one inch pieces it takes about a half hour. You want to be able to dent it, but you don’t want your finger to go all the way through. I don’t have one, but two of my friends do! You can find one here and one here. I used Carnation evaporated milk instead of cream. It was delicious and should improve stability of not being refrigerated. More choco chips could be used for a darker chocolate icing, but I like the lighter flavor. I piped it on small thick butter cookies. What brand of heavy cream? Or can i use evap milk? Hi Erlyn, don’t replace with evaporated milk, and the brand of heavy cream shouldn’t matter. will coconut milk work instead of heavy cream? The coconut milk from the can is very thick. Sofia, I see that you used the coconut milk and it worked. I’m so sorry I didn’t respond sooner! I’m glad it worked though and I appreciate you coming back and letting me know! I used canned coconut milk and cacao vs cocoa powder and it turned out well. It was a little thick so next time I would use more milk. I did beat it a lot in my Kitchen Aid mixer. Just made this and it’s amazing! I didn’t have any issues but I did add a little bit of cream as I was adding the sugar to help it along. Two thumbs high! So glad to hear that Cayla!